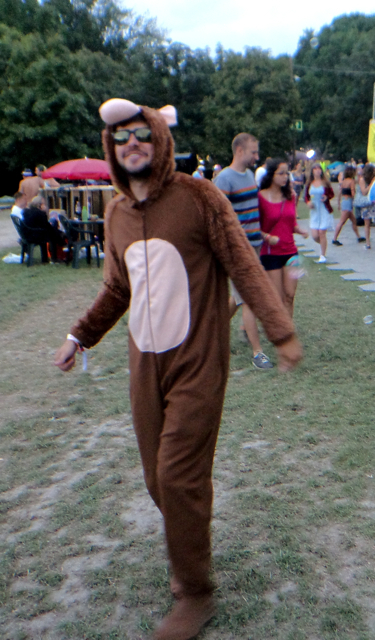 What to not miss out at Sziget and other special things that are good to know. Last post before the festival, come back for more during Sziget! 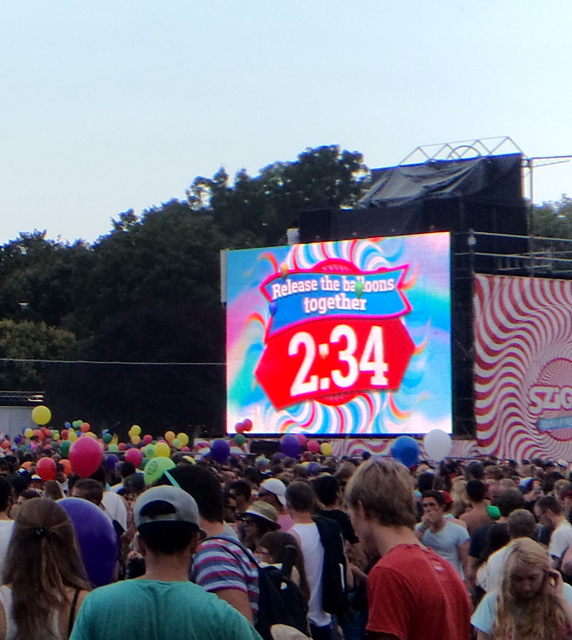 Every day before the big names start their shows on the main stage, Sziget offers thematic parties. 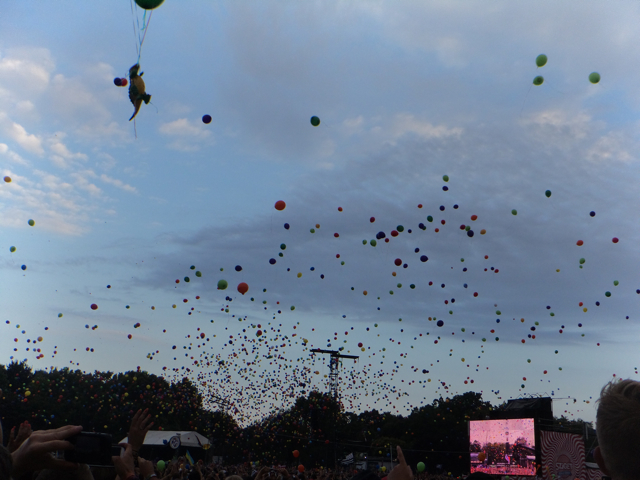 In 2014 that was: balloon party, flag party, beach ball party, bubble blowing, color party (many people remained colorful until the end of Sziget) and party serpentines. The opening and closing party had also special effects ranging from fireworks to flames, glow sticks, confetti rain, glow balls and laser show. So make it around 7 pm to the main stage. I am not the biggest patriot, but there is something about the flags being carried by people. It also serves as a mobile meeting point (if you are not Belgian or Dutch, as you would have to have some distinction on your flag, because there are many). So make sure that you bring your flag. It is not obligatory to take your country’s flag either, just take a flag or be creative and make one on the spot. 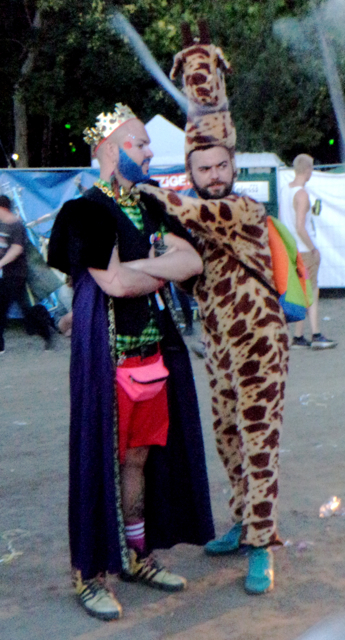 This is something that I saw for the very first time at a festival. This is for sure because I have never been before to a major festival and nobody wears costumes at Czech festivals. But it is a nice tradition and if you are extravagant or brave enough, take yours too! 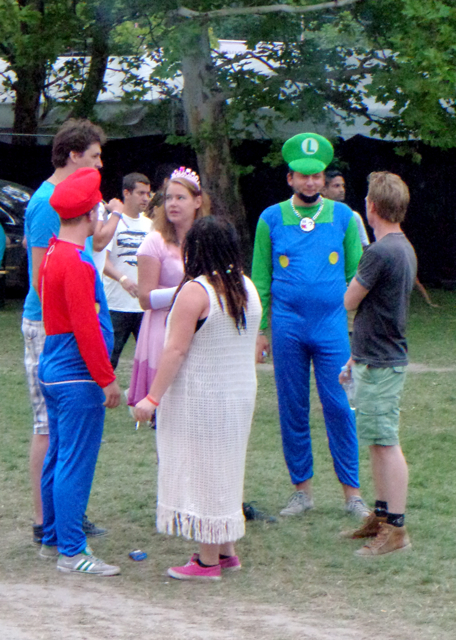 I saw last year a walking dinosaur, Mario and Luigi and their princess Peach, Goofy, tigers and many others. As the weather forecast is indicating that it would be crazy hot, keep it light. Or the other option is to take some distinctive fluffy animal and put it on a stick (that is what I will have this year, look for my red Alpaca to cruise the festival grounds and make pictures with us). But to be honest, funny sunglasses or hat would do too! You can find a beach in the north of the Obudai island. It has everything a proper beach should have, including a beach bar and DJ. I am maybe too sensitive, but I would not dip myself into the Danube, but this does not mean that you should not. 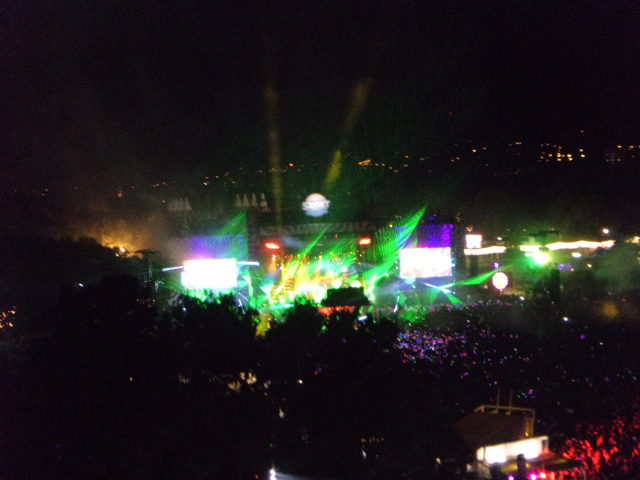 As you can guess the Sziget venue is not a festival the whole year, it is actually a parc that has some street lights. But when you are at a festival, you need to have much more light. 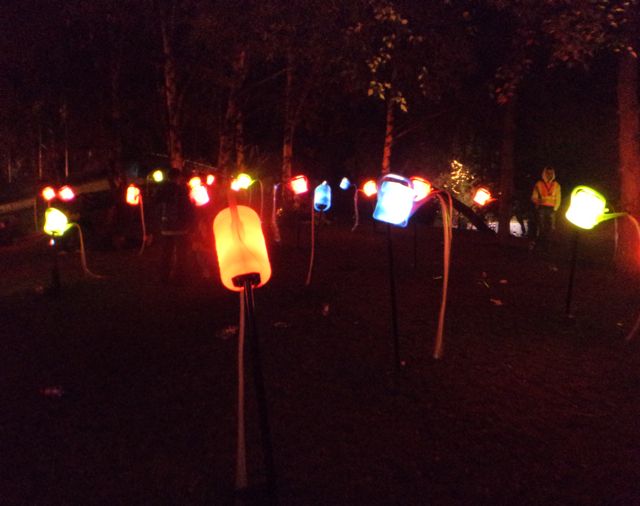 This is solved in a very neat way and every different camping section has also its very own light installations. My all time favorite are the little aluminum stars that are hanging between the branches of trees and there is a huge reflector shining on them and they give…reflections. 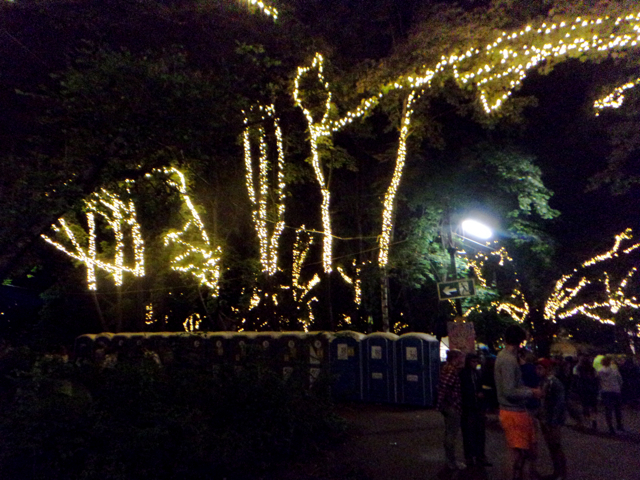 There are also huge glowing and disco balls and trees wrapped in Xmas lines. 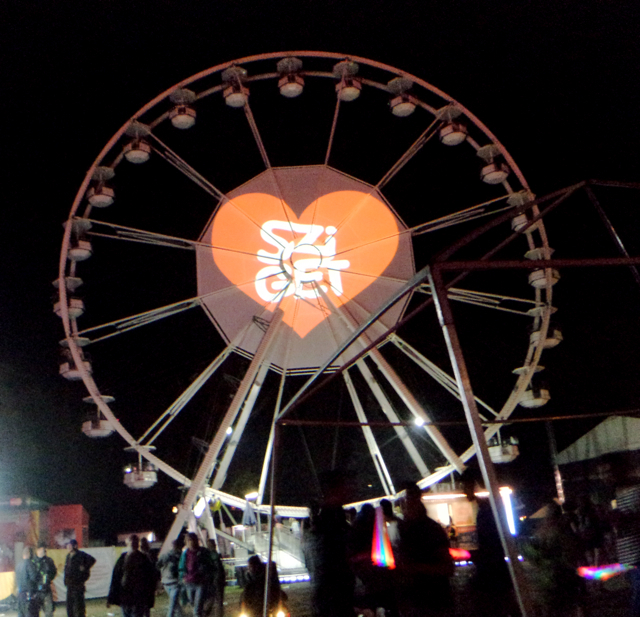 You for sure know the famous London Eye, Sziget is so prominent that it has its own Eye too. Check out, maybe you can get a discount, if you are a proud MasterCard owner. Last year we went on the Eye during the closing show with Calvin Harris and it was truly amazing to see the people with neon tubes and the final fireworks from a bird perspective. Hungary is hot, this year is feeling like the hottest year ever and the weather forecast is not showing any rain until the last night of Sziget and daily temperatures of 34 degrees. As the festival goers came primarily for music, it is quite handy that there are little lines spraying water on people on the main stage. It would be practical to have more of those, but I am sure you will find ways to cool yourselves down. 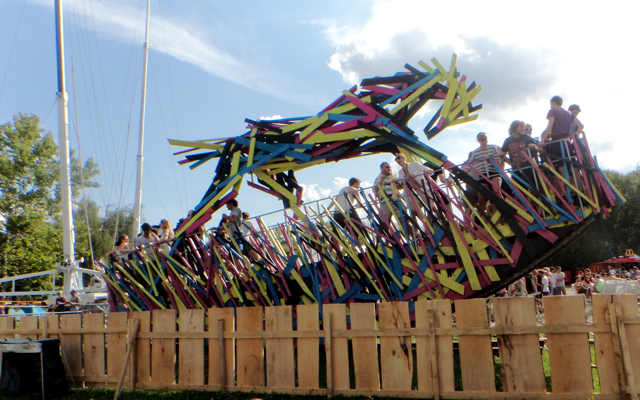 If you are an artistic person like me or just like nice things, then Sziget has really a lot to offer. There is a whole art zone, where you can kill some time, make some art and entertain yourselves while having a blind moment in the music program. 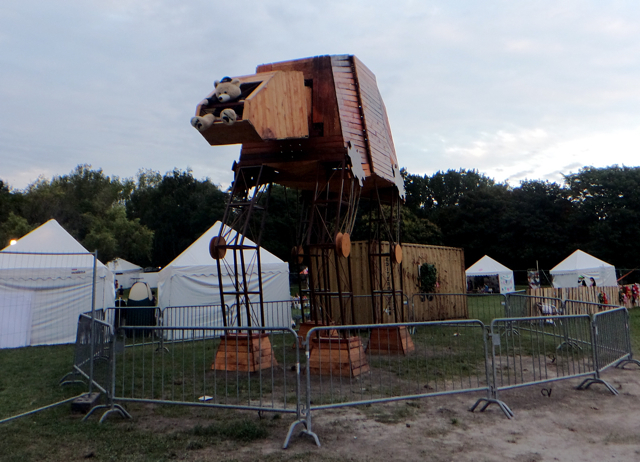 There are also a lot of nice sculptures, installations and colorful things that you could enjoy throughout the festival. There is basically no blind spot on the festival. My personal favorite is the robot. I witnessed the making of it when visiting the island before the festival. And I am quite excited to see the finalized piece. Find it too! This is a very special thing for which people stand queues. This year it is called Miracoco and it comes from Nottingham (UK). But what is it? 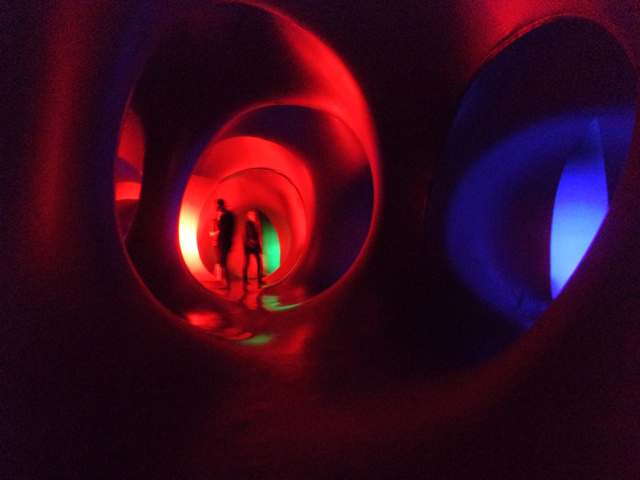 It is a plastic inflatable sculpture taking 800 square meters and it is a sort of labyrinth, in which huge domes are connected through tunnels. Various sections have different moods because of the use of light and colours. Do not miss out! Entrance is free. For details, check the website of Architects of Air: www.architects-of-air.com. These are my top Sziget picks, hope you would manage to enjoy them as much as I am planning to! Tomorrow, the madness starts! When I was driving today on the Érzsebet bridge, I already saw flags of Sziget on it and I just realized that I cannot wait for the festival to start. Come back to my blog for more articles during the festival. If you do not want to miss out anything, subscribe by email (scroll down) or follow me on Facebook.